Great for commercial use in restaurants, bars, and convenience stores. serious output even on hot summer days! This is the workhorse of margarita machines! craziest of partiers, look no further. 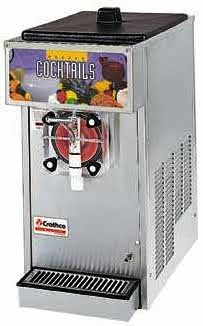 Produces upto 8 gallons of frozen beverages per hour! you pay no sales tax! What a bargain. Call NOW! Click here for great deals on used equipment similar to this machine.